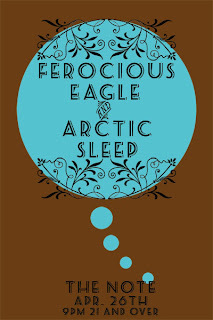 So this is the rough idea for a poster for Arctic Sleep. It should be two color screen print on 12.5" x 19" chocolate speckletone paper. I still don't know if there is going to be other bands on the show. But the show is less then a month away. Any-ho you can check out Ferocious Eagle here.